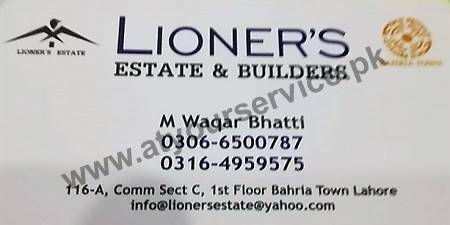 Lioner's Estate & Builders deals in sale, purchase and renting of residential and commercial property in Bahria Town Lahore. Lioner's Estate & Builders is located in Sector C, Bahria Town, Lahore. It deals in sale, purchase and renting of residential and commercial property in Bahria Town Lahore.